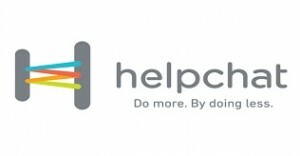 Helpchat, India’s biggest AI-powered personalised transactions platform. Be it anything, from recharging your phone to booking a cab, from booking movie tickets to ordering food, from shopping assistance to finding deals & coupons, from personalised news to intelligent reminders - Helpchat can get all of them done for you. Helpchat is One app for everything: recharge, deals, cabs, news & lot of other stuff. Download & recharge your mobile, book cabs, stay updated with the current pollution index, traffic in local area, get the best deals online & daily weather forecast always. 3. Enter required details and click on register button. 5. Now, Open Dashboard & Click on Explore > click on UBER and Ola. 6. Now Book a ride at uber or ola and make a ride atleast for rs. 190. 7. Then apply 110% cashback code of Helpchat which you purchased from Nearbuy. 8. Complete ride atleast for Rs. 190. 9. Thats it, you got 200 Rs. + Referral bonus 100 Rs. which will be credited in 24 hours. 1. Firstly Click on Profile Icon on top right. 2. 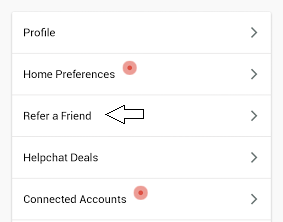 Now click on Refer a Friend. 4. If your friend download and signup on helpchat app by your referral link and book his first cab ride rs. 80 then you will get Rs. 100 referral cashback and he will get rs. 100 cashback too. Paste it and Now Download Helpchat Via Your Link. Now Book A Cab And Apply Code. Complete A Ride Atleast 190rs To Get Full Cashback. For More refferals Change everything Via Phone Id Changer And Device Emulator. Make Sure You Add Package Name In Device Emulator. Proceed same steps again and again for unlimited referral. 100rs Referring bonus Will Be Credited in 24hrs. Sam Spa Center is renowned for offering excellent spa services in India,its the leading body massage center with best deals and offers.